I spent some wonderful time at one of my favorite places today. It is Enchanted Gardens and it is not a nursery, it is an experience! I picked up a few new items and tiny plants for my fairy garden. Spring is here and the poor fairies were despairing that I had forgotten about them. I purchased the boys at Target last year. I found the girl at Hobby Lobby recently. Most of the accessories are from Enchanted Gardens or Home Goods. Check out the ladders from the hanging baskets! After writing this post, I created a fairy garden page. 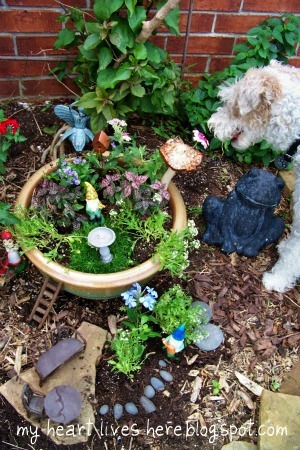 Please use the tab on the top of the screen or click here if you would like to see more photos of the fairies at play. So glad you both stopped by! I love fairies. That garden is so sweet! 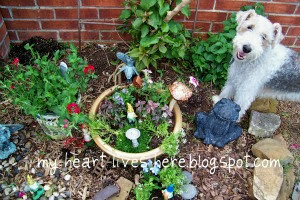 I Love your fairy garden! So very cute! Hi! 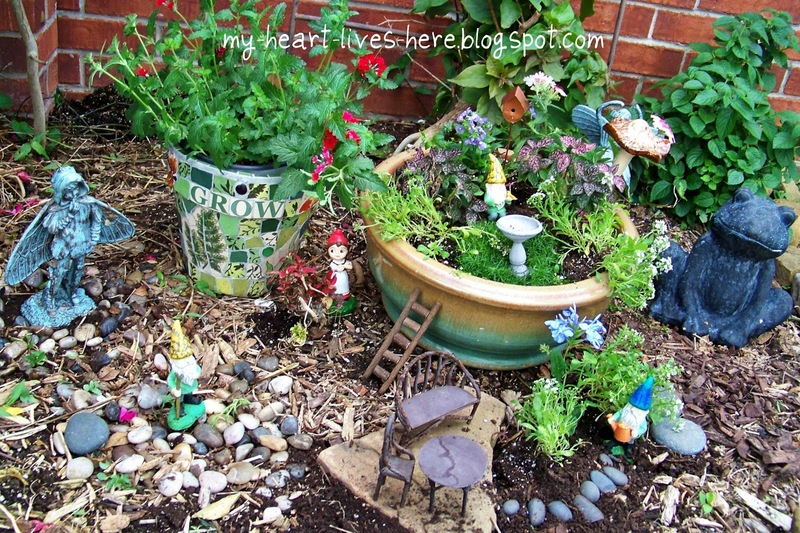 found you through Mingle With Us Blog Hop, thru Happy Go Lucky - LOVE the little "dollhouse" in the garden! maybe this fairy project can be on mt to do list for next year's St. Patty's Day. stumbled onto your blog via the blog hop and just wanted to leave you a little blog luv! Def enjoyed reading this post!! new follower! How fun! 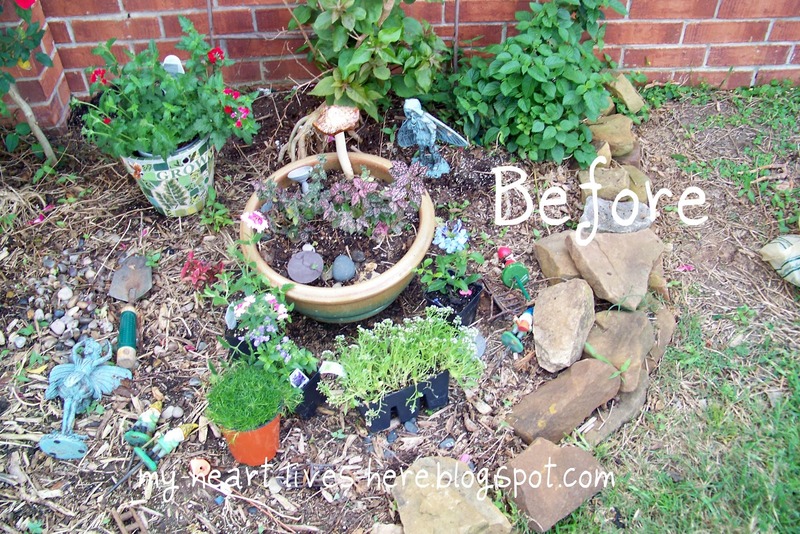 I would love to make one of these gardens with my kids! Thanks everyone for the great comments. Thank you especially to Cameron at Cameronhomemade for the Liebster Blog nomination! You have made this little blogger very happy. Thank you so much for stopping by. I absolutely love fairy gardens. I started one place about 15 years ago and now I have another.I started inspiring my friends to have them and now we can't stop. 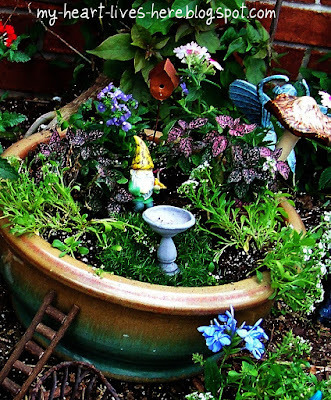 It's wonderful to meet people who enjoy miniature gardens. Can't wait to see more!Thanks for sharing. I love the ladders. Where do you find them? I think next week I'll have our linky party theme on miniature gardens. New Follower. What a great garden you've created. 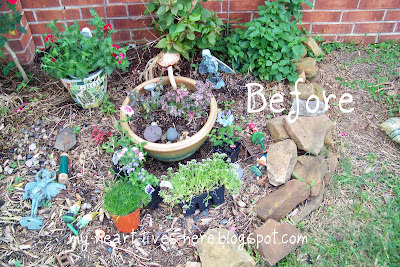 I love fairies and am waiting for some to come visit my little garden. 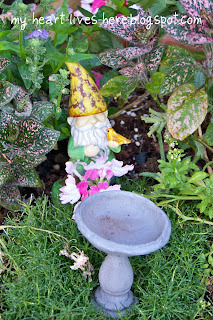 Have you seen Faire Garden blog? She has lots of fairy ideas. Wow ! Gorgeous... The fairies and Mr.froggie look so cute... !! So cute! Thank you for linking up to Home Sweet Home! So glad I found your link. Your fairy garden is delightful! I've made seversl in the past and just posted about one I made in a wheelbarrow. I'm your newest follower.